I like to spend time the week between Christmas and New Year looking back at my journal entries and seeing the journey that God has had me on for the past year…the things I’ve learned…the struggles…the joys…prayers that have been answered and some that haven’t…and then pause to give God thanks for His never ending grace in my life. For the past couple of years I have seen patterns where God was transforming my heart and have titled those years by a word. 2011…Change. 2012…Interruption. Just saying these words brings stories and pictures to my mind of lessons learned where my heart needed to surrender. This year I am doing something a little different. I am choosing my word at the beginning of the year rather than discovering it at the end. I have been evaluating my heart and asking God to show me where He wants my focus to be this entire year so that I can glorify Him more in my life. This was not an easy task to do. I thought of many words that I would have liked to have chosen, but God kept directing my heart to the word He was choosing for me. Not an easy word…not a fun word…but one that is needed in my life to be the woman that God will use further. 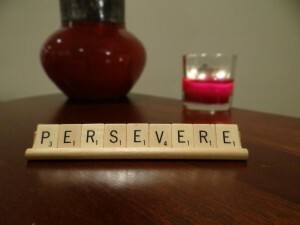 The word is…PERSEVERE! This will be the word that I will focus on in 2013, allowing it to direct my thoughts and vision for the year. I will think about it, talk about it, journal it, and pray about it. I will let it shape my choices with my attitude and actions. I will remain in a focused position long enough for this faith-fueled process to happen. My one word will hold me there. Here, I will watch God and be amazed as He does what only He can do in and through me – transform my heart. Because God’s Word is so precious to me and gives me strength for the journey, I have taken a verse that will help me to begin being intentional about persevering. “Be joyful in hope, patient in affliction, faithful in prayer.” Romans 12:12. I know that throughout the 365 days of this year (now only 358) there will be many more verses that God will point to and ask me to persevere through and live out. But here is where I will begin. You continue to minister to me and that is ongoing as I minister to others with my position at the church. Thank you so much for what you are doing! Thank you Glenna for your encouragment to me! So exciting for me to watch how God is using this website for His plans and purposes. It’s also exciting to see how God has moved you into a new church plant. Can’t wait to hear more. Love you my sweet sister-in-law!!! So thankful for your post. It is so true that as we deepen our relationship with Christ, trusting Him more and more, and not leaning on our own understanding, He shows us more and more of His plan for us. Proverbs 3:5-6. Much love to you! I have a real good feeling about 2013! Ann Marie, these are such great words! Thank you for sharing! When you have a moment, check out the co-author of My One Word website – http://www.rachelolsen.com She has a wonderful article there called “Define the Win with Your One Word” that will help you in determining a list, prayerfully, of things that you want to do in your life this year to make this word more alive in your life to glorify God. The purpose of this is to be intentional in living out your word.